We hope each of you have a wonderful day full of laughter, delicious food and precious memories. Enjoy your day celebrating with all your loved ones. If you, or someone you know, is looking for a place to celebrate then join us for a free Christmas lunch at 1:15pm. There will be plenty of mouthwatering food and tons of sweet treats! And come back at 7pm for a Christmas evening service and free dinner as well! All of our meals are free for anyone and everyone! We don’t want anyone to be alone or hungry on Christmas so please make plans to celebrate with your Hope Center family! The Christmas meals are served in our dining room located in our main building on Prospect St. Entrance to the building is located on our central parking lot off of Church Street between Prospect and Walnut Streets. There is plenty of free parking available in our central lot. For more information about the location of The Hope Center go to http://www.hagerstownhopecenter.com. Koffee Klatch Season Finale is Thursday! Ladies, this Thursday is the last meeting of Koffee Klatch until the fall. And since we’re saying goodbye for the summer, we’ve decided to make it a little special. Instead of having a time of donuts and fellowship before the Bible study, we’re serving lunch after! This special Koffee Klatch starts at 10am instead of 9am in the Trinity Center. Our Bible study, prayer time and worship session will take place first followed by a delicious lunch. And like usual, this entire event is free! This is a great opportunity to invite other ladies who don’t normally take part in Bible studies or regularly fellowship with other Godly women. Again, Koffee Klatch this Thursday starts at 10am in the Trinity Center followed by a lunch. If you have any questions please call 301.739.1165. I’m sure by now you, like everyone else, are tired of the back-and-forth going on between the two political parties in DC. All that we hear is how our elected officials can’t seem to compromise and work out their differences and have forced our federal government to shut down causing some federal employees to lose paychecks and forcing other government operations to cease their daily activities. Many Americans may not feel the effects of this shut down other than being inundated with the constant news coverage of this fight in our capital. But for the Americans who work for the government or rely on the various programs sponsored by our government, this is a very stressful and troubling time. As services and programs are getting cut, we are happy to inform you that none of the programs, services or ministries at The Hope Center will be affected in any way. 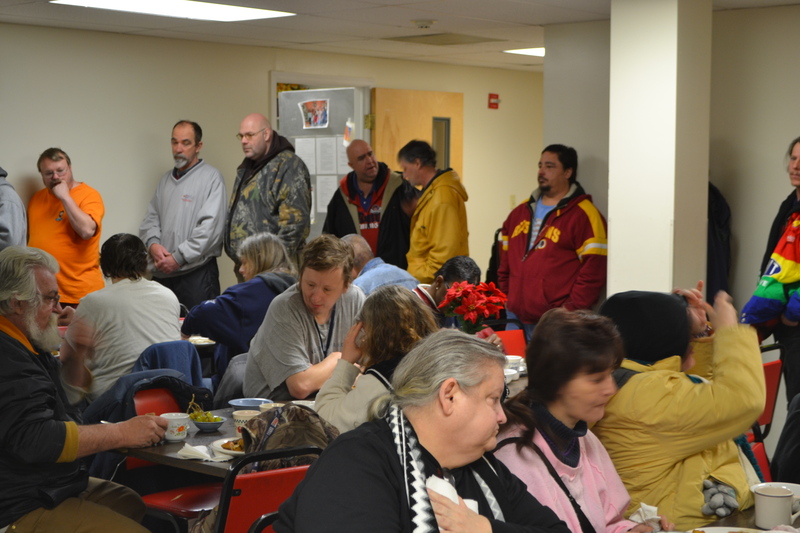 Even if our government fails to reopen in a month, our doors will remain open, beds ready and meals served for the hundreds of people each month who come to The Hope Center to meet their physical, emotional and spiritual needs. You ask, how can you remain open during a time when services are being cut? It’s easy. We can remain open, operational and fully functional during these troubling times because we do not receive any funding from the government. We never have and we never will. We are totally independent from the government. We don’t use any tax money to fund our ministry. And we’ve been doing it that way since 1955. Our ministry is open 24 hours a day, 7 days a week, 365 days a year. And we do it because God has provided for our needs every single day that we’ve been open. Thanks to God Who has given us many friends like you, we’ve been able to navigate through other government shut downs, recessions, tragedies and trials. Our supporters help us focus on what’s important: helping others. During economic good times and bad times, homelessness, hopelessness and hunger exist. We’ve taken to heart God’s command to give to the least, the last, and the lost to heart and we’ve made it a goal to do that no matter what. So as our country faces new sets of challenges, we can say with confidence that we will be here to help neighbors in need. We don’t rely on any government to meet our needs. We trust in God to provide – and He always has! Financially support The Hope Center each month. We appreciate the generous donations from individuals, churches, businesses, organizations and other groups who faithfully provide the essential funds to continue providing hope. Donate gently used items of furniture, clothing, shoes, toys, books, household and other various items to be sold in our Thrift Stores. The sales generated from our Thrift Stores in Hagerstown & Chambersburg help to keep our programs operational. Items sold in the Thrift Stores also give families and individuals on tight budgets the opportunity to buy “new” things needed for everyday living without doing damage to their budget. Donate food items for our pantry. We use a lot of food at The Hope Center. We provide several free meals a day to our residents and daily guests. In addition to meals served, we operate a food bank where hungry neighbors can receive food for their homes at no cost. Therefore, keeping our pantry stocked is very important. Helping us by purchasing items like peanut butter, coffee, sugar, cereals, canned fruits and vegetables and other items is a huge blessing. Volunteer your free time to one of our ministries. There are many ways to get involved. From helping to clean, paint, build, sort, teach, serve or entertain, there are so many interesting options available to you to help make a difference one-on-one in our community. Shop in our Thrift Stores. Sometimes you just need some items at a low price. We can help. If you find yourself heading to second-hand shops, come to ours! When you purchase from our stores, you’re helping to feed the hungry or provide a hot shower to the homeless. And when you’re finished with your items, re-donate them so someone else can use them! We have two Thrift Store locations in Hagerstown and Chambersburg. Pray. Pray. Pray. No matter what else you can do to help, please pray. This is the most important. God hears the cries of His people. He helps His people. But if we fail to pray, then we are failing to believe. We can’t do this alone. We need God’s help and guidance. Join us in praying for our ministry, our staff and volunteers and especially all the precious lives who will seek help at The Hope Center. We can’t rely on the government or really any other human entity. Only God can faithfully provide. He always has and He always will. Thank you for working with us to keep our programs running. In times of uncertainty it’s important that our community knows that we are here to help and we aren’t stopping for any reason. For more information on how you can get involved in any way, please call 301.739.1165 or email us at hagerstownrescue@verizon.net. Every day at 1pm, 1:30pm on Sunday, our kitchen is host to our SoupLine program. 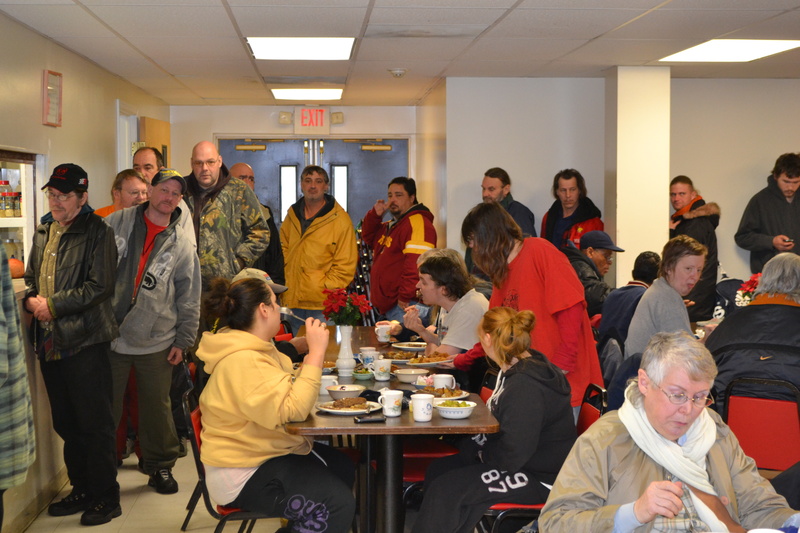 SoupLine is a free lunch experience for anyone in the community who needs a hot meal for free. Five minutes before lunch is served, a Hope Center staff person leads a small devotional with an inspirational or motivational message followed by prayer. As the economy continues to struggle, our numbers have been on the increase. We feed all types of people each day at SoupLine. From single men & women, to families and young adults, our kitchen has been busting at the seams. As this economy keeps making it more difficult for people to afford food in addition to other expenses, we believe that our numbers will continue to rise. Unfortunately, we are already hitting capacity. Now is the time that we start looking for new solutions to our dining issues. We’re beginning to look for options to expand to allow us more opportunity to reach people’s physical needs so that we can touch their spiritual needs as well. As we begin to explore different options for the future of our food services ministry, please continue to support us as we feed hundreds of hungry people a week. Your continued financial support helps to keep our kitchen open for our daily guests. And any food donations help to keep our pantry stocked, not just for our residents or guests but also hungry families in desperate need of groceries. If you are interested in donating items for our pantry or organizing a food drive, please call 301.739.1165 or email hagerstownrescue@verizon.net for detailed info.